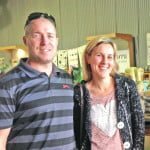 “We love everything about YarraFarm Fresh!” Sarah H, Wandin. 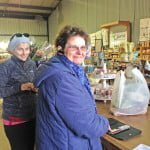 “I buy nearly all my gifts here, thanks for the great range of ideas.” Jan, Coldstream. 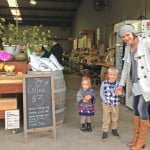 “I like being able to support our local farmers when I shop at this great shop. And I love Harley!” Lena M, Yarra Junction. And here’s some happy snaps from other wonderful customers in our shop. Wow, we love you all! 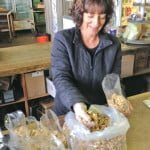 As we have plentiful shelled walnuts in season, the other night I took a pack of rocket and a bag of walnuts home. When I make pesto I don’t use garlic as the garlic can be added to the individual dish later. In a blender place chop up parmesan cheese, or if its already grated add it at the end. Set parmesan aside. In blender chop up two or three single handfuls of freshly shelled walnuts (or almonds or cashews). Set aside Walnuts. Place all the rocket leaves in the blender, a good pinch of salt (I prefer Himalayan pink salt, sold at YFF in a grinder) drizzle in some olive oil. Run the blender until the leaves begin to chop, stop and add back in the parmesan and walnuts. Turn on the blender on low speed. Add olive oil as needed to bring pesto into the right consistency. 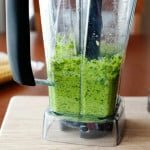 Remove from Blender into a container. If not using right away, pack it down tightly and add some olive oil to sit on top while in the fridge to help keep the bright green colour. We love this pesto – what a healthy way to increase your greens! 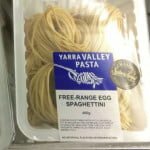 For an easy and delicious dish, add this pesto to Yarra Valley Pasta (we have a whole selection in the shop) and toss in some freshly chopped tomato or red capsicum – yum! We’re in the July/August issue of Town & Country Farmer! 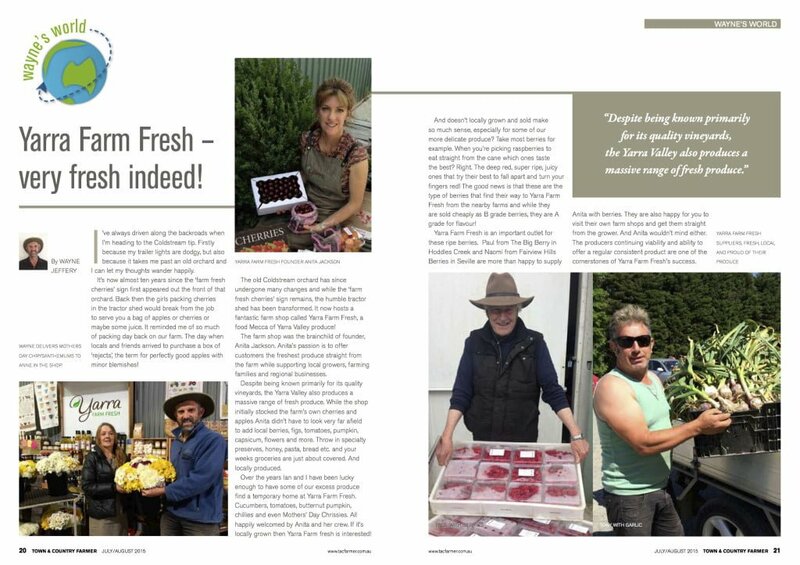 Great article by Wayne Jeffery, giving us a fantastic plug and featuring our passionate local growers and suppliers! Fabulous Australian walnuts from Bruce’s farm in Toolamba is being packed in the shop this week. We have two varieties of walnuts at the moment – Franquette and Tulare – delicious and creamy. Come and taste for yourself. 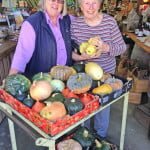 We’ve been eagerly awaiting these heirloom seeds and pumpkins, grown in Toolangi by Willa. Here’s Joan Sydney (played the part of Matron Sloan from TV’s ‘A Country Practice’), joining Willa for a happy snap. Joan lives locally and has been a regular for years. 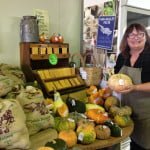 Yarra Farm Fresh team member Sue loves Willa’s pumpkins and labels up every single special unusual pumpkin!